Food on a stick, right? Feels like summer. The thing I love most about satay is that it makes me feel on the ball – it provides an excuse to buy meat in a bigger (read: cheaper) package, then divvy it up, slicing half to freeze in a quick marinade that will protect it from freezer burn. It goes ahead and marinates in the freezer until you’re ready for it, and thaws quickly on account of already being in pieces. And then cooks in just a few minutes, too. Also? 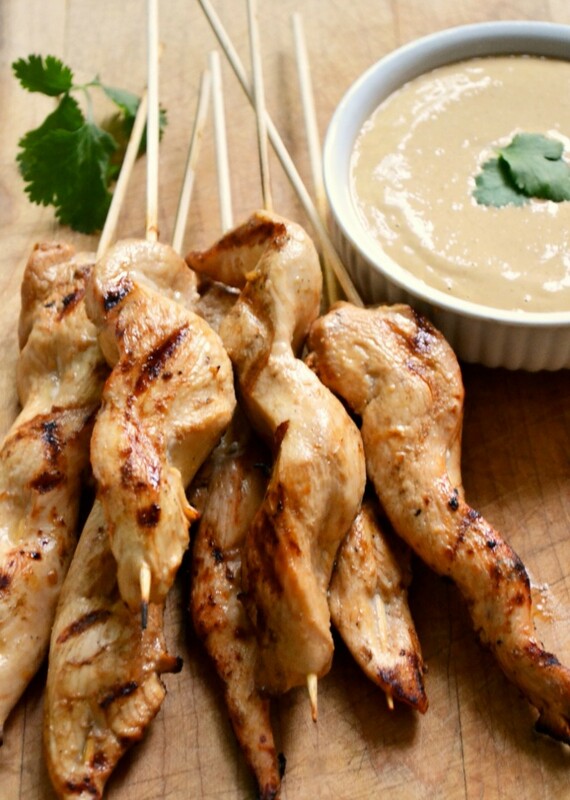 You can dip them in peanut sauce. I would happily dip a pencil in peanut sauce. I’m usually a thigh girl; skinless, boneless chicken breasts don’t do much for me, but they do work well here if you’re a fan. Chicken thighs have more flavour, but are trickier to work with – cut them into chunks or strips and thread them on any which way. There’s no need to keep them neat, and in fact mashed-together pieces will cook evenly and stay moist. 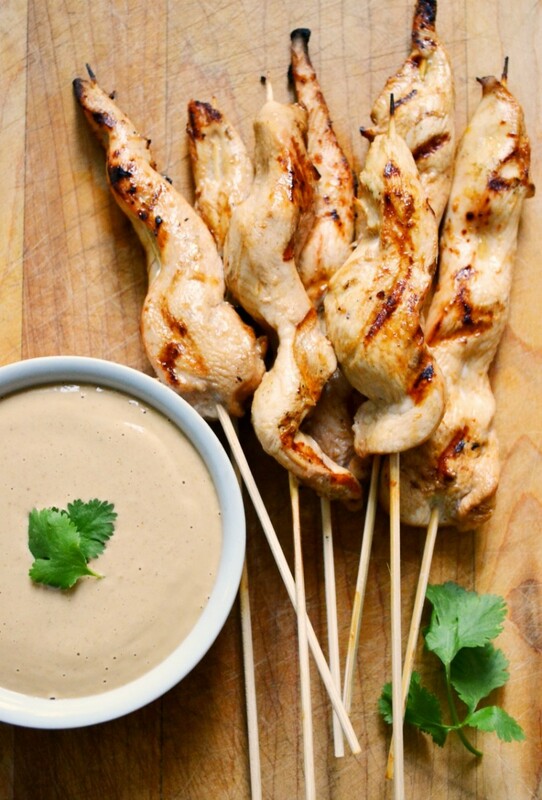 If you want smooth, S-shaped satay, go for the white meat. When you make the peanut sauce, there’s no need to precisely measure – I often just lob ingredients in, or shake them up in the peanut jar when it gets close to the end. A blender or food processor is easy, but if you want to mix it by hand, warm the peanut butter in the microwave first (it’s easy to do right in a glass measuring cup) to make it easier to blend. The recipe is easily doubled if you want to keep a jar in your fridge – make it as thick or thin as you like with water or coconut milk. If you like coconut flavour but don’t have any (or don’t want the added fat), add a teaspoon of coconut extract. 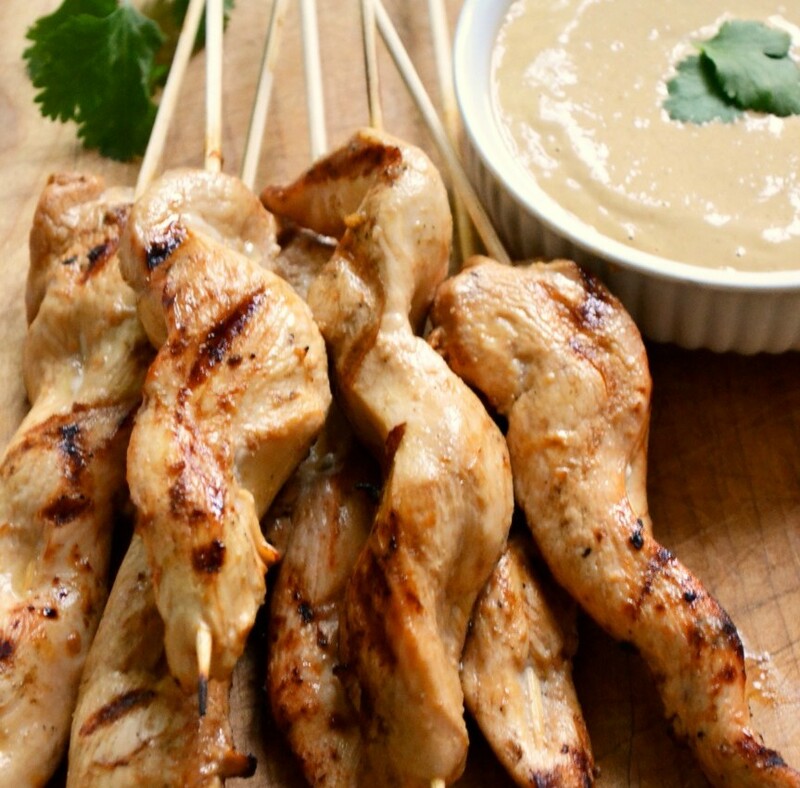 1To make the satay, cut the chicken lengthwise into fairly uniform strips (or cut pork tenderloin in half crosswise and then lengthwise into strips) and place in a bowl or zip-lock bag. Combine all the marinade ingredients and pour over the meat; toss well or squish the bag to coat and refrigerate for at least an hour or overnight, or freeze for up to 4 months. 2When you’re ready to cook them, soak some bamboo skewers in water for about 10 minutes to prevent them from burning. 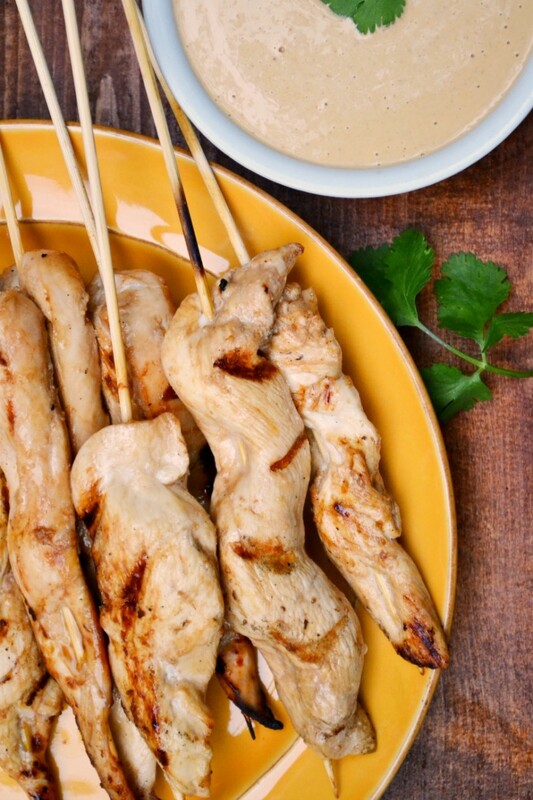 Thread the chicken or pork strips onto the skewers and grill or broil for a few minutes on each side, until just cooked through. 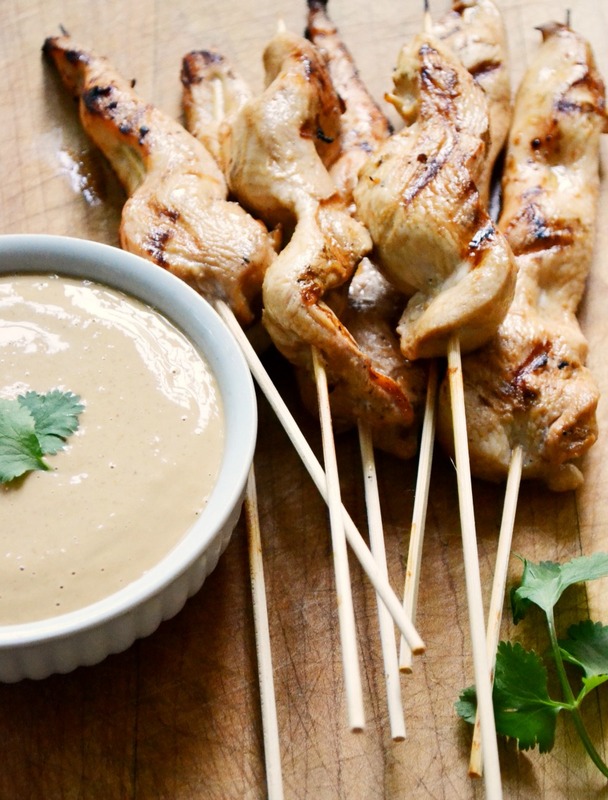 Serve warm, at room temperature or cold with peanut sauce for dipping. 3To make the peanut sauce, combine all the ingredients in a blender or jar and whiz, whisk or shake until smooth. 4Makes about 20 satay, and a scant cup of peanut sauce. Thanks Julie, looking forward to making these soon! Hi Julie! 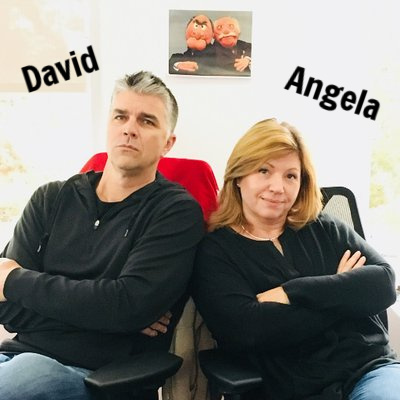 Been wanting to sign on to comments for a long time. I love your website and check it everyday and try lots of your recipes. Hope you’re well!! This was a huge hit with our 5 boys for our Sunday Supper. I love this website. I am making rice pudding this morning – I love it for breakfast or a snack! Aw thanks, that’s so great to hear!